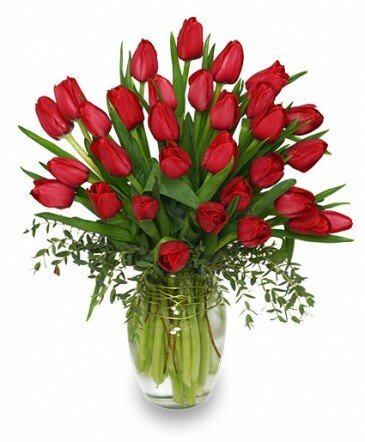 Ginger Jar Vase, Foliage: Italian Ruscus Or Something Similar, Red Tulips. 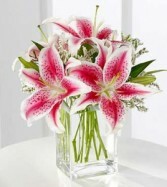 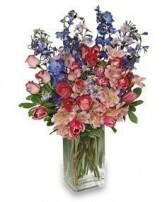 Tall Square Vase, Foliage: Variegated Pittosporum, Bicolored Hot Pink & White Miniature Spray Roses, Bicolored Hot Pink & White Tulips, Blue Bella Donna Delphinium, Pale Pink Alstroemeria, Lavender Monte Casino Aster. 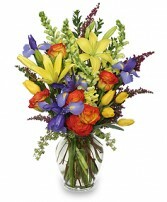 Classic Urn Vase, Foliage: Myrtle, Seeded Eucalyptus, Bicolored Orange Circus Roses, Yellow Snapdragons, Blue Iris, Yellow Asiatic Lilies, Yellow Tulips, Sunset Heather.